It is popular among users to install messengers (i.e. web applications like ICQ, WhatsApp, etc.) on either their mobile phones or computers and exchange messages via the Internet within the same network. For instance, if a user has registered with WhatsApp, they can send free on-net messages (i.e. 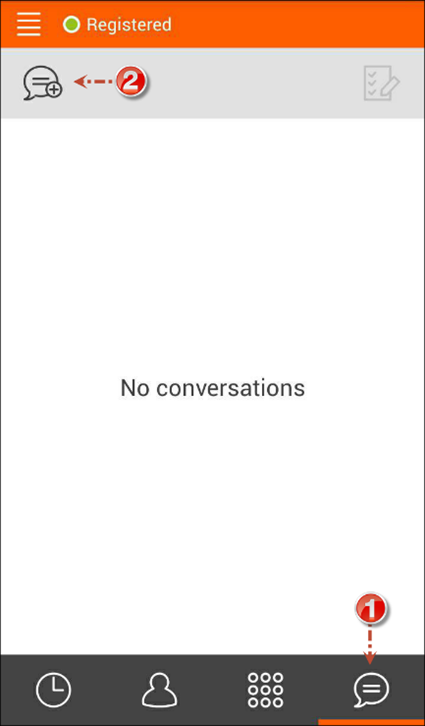 instant messages) to other WhatsApp users. This service is known as Instant messaging. With PortaSwitch®, you can enable your VoIP customers to use Instant messaging service by registering their SIP accounts with various messengers (that support the SIP protocol). Moreover, you can develop a custom application to bundle voice calls and messaging services and then distribute the application among users of different networks (VoIP and mobile), and thereby expand your customer list. 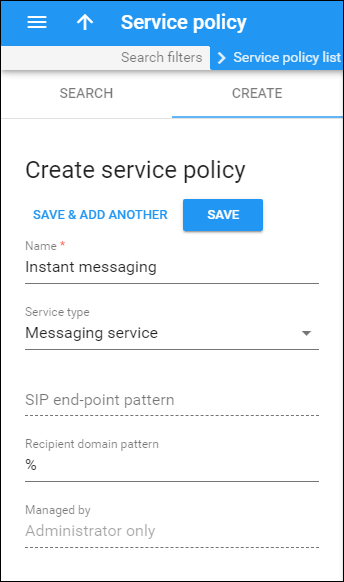 This chapter demonstrates how to configure an Instant messaging service so that in addition to voice calling, your VoIP customers can send instant messages. Create a service policy (e.g. Instant messaging). 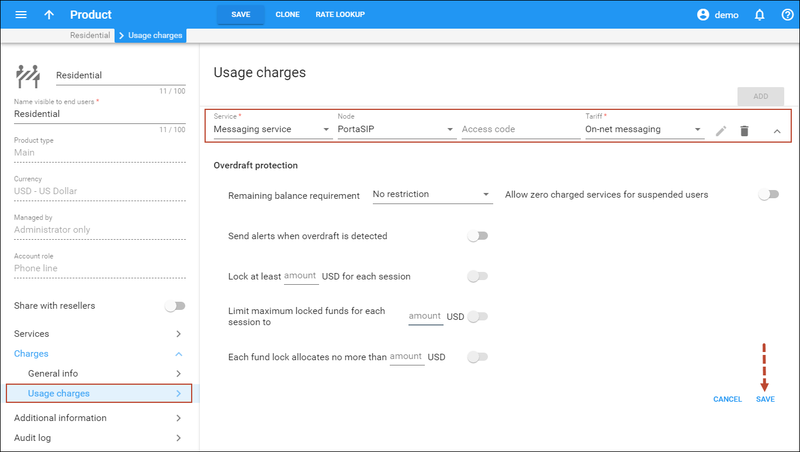 It determines the use of SIP protocol for on-net messages and it is also used for internal communications between PortaSIP® and the billing engine. Create a vendor tariff for IM services (that will be referred to as tariff A later on). 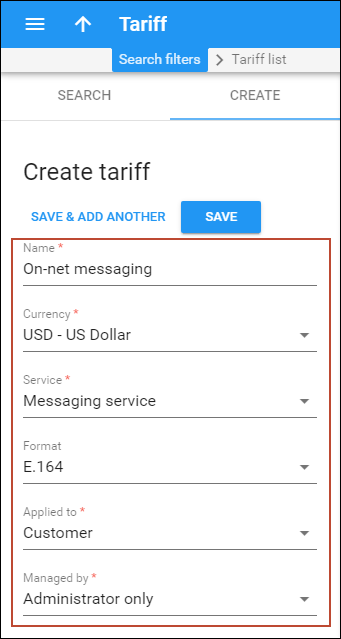 Make sure this tariff has the Messaging service assigned and the Routing option disabled! 2. Select BillingEngine on the Configuration Tree. 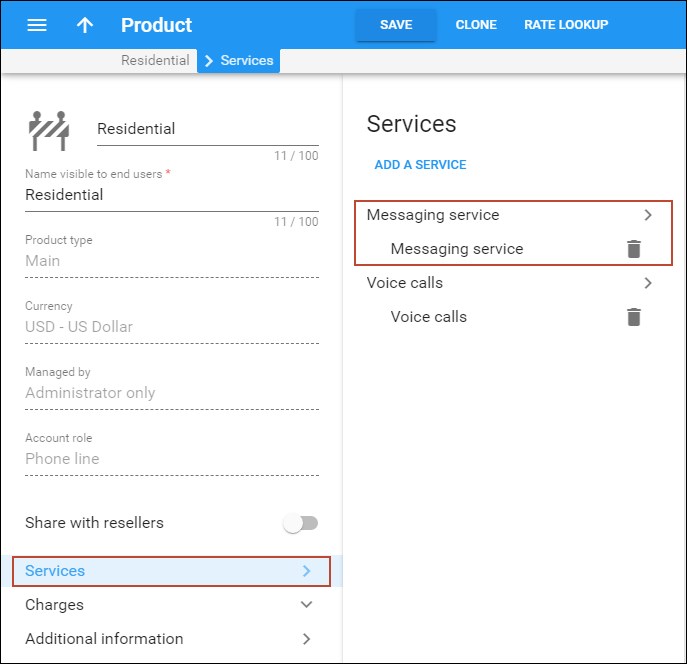 Enable the Messaging Service in the ServiceTypes group. 3. Click the Save button and then the Verify button. 4. Verify the new configuration and click the Check / Apply button. The special MSGN destination covers messages sent to an IP phone connected to PortaSwitch (regardless of the actual phone number). Adding a rate for this destination allows you a set a unified price for all on-net messages. Please consult the Special destinations chapter of the PortaSIP Administrator Guide. 1. On the navigation menu, select Service catalog, Rate Codes and then Destinations. · Format – Select Custom. · Prefix – Type in MSGN. · Description – Write a short description for the destination. At this point it is necessary to create a service policy that is used for internal communications between PortaSIP® and the billing engine regarding routing and transport protocol that is used for message delivery. · Name – Specify the name of the service policy (for example, Instant messaging). · Recipient domain pattern – This is the pattern according to which the service policy is selected. Specify % in this field. This means that the service policy is applied to all outgoing messages sent by your end users. 4. On the Service policy panel that opens, specify 5 in the Match priority field. Please refer to the PortaBilling Help for detailed description of this field. · Transport protocol – Select a checkbox and choose SIP from the list. · Local lookup – Select a checkbox and use a slider to enable the lookup for destinations within the network. · Userpart E164 translation – Select a checkbox and use a slider to enable dialing rules for a phone number translation. Note that it will take several minutes until the changes are propagated to PortaSIP® and Radius server. · Name – Type a short name for the tariff object; this is the name you will see in the select menus (for example, Instant messaging). 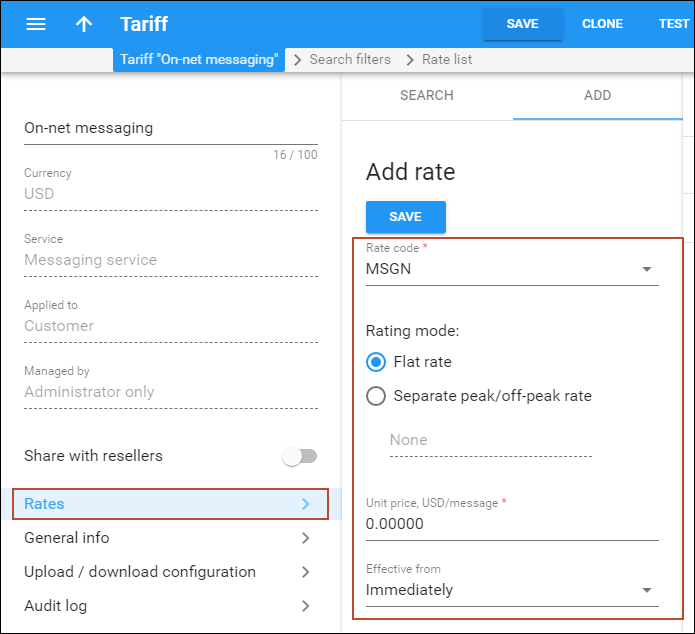 · Routing – Leave the Routing option disabled for this tariff. 1. On the vendor tariff’s panel (Instant messaging), click Rates. · Rate сode – Type in ‘|’ (pipe) in the field. This will create a special rate that matches any number the message is sent to. · Unit price – Set zero as the price since there are no actual costs for on-net instant messages. · Leave the other fields in the form as they are. In this step, you will add a new connection to the internal vendor. 3. On the Results panel click the vendor name. 4. On the Vendor panel, click Connections. · Description –Type a descriptive name for this connection. It will be displayed in the list of connections (e.g. Instant messaging). · Type of connections – Select SIP/SIMPLE. · Currency – Choose the currency in which you charge your customers. · Service – Select Messaging Service here. · Managed by – Leave Administrator only. 1. On the customer tariff’s panel (e.g. On-net messaging), click Rates. · Rate сode – Select MSGN. A destination prefix may be entered directly (e.g. 1604) or you can start typing the destination and then select it from the list. · Unit price – Specify the price per message or put a zero if you provide instant messaging services free of charge. Since the IP devices and applications connect to PortaSIP® via SIP protocol for both messaging and voice calls services, the product for messaging product must include voice calls and messaging services. 4. Select the Messaging service and click Add. 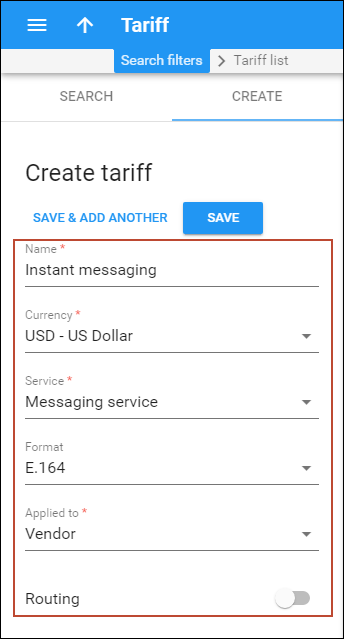 · In the Tariff field, select the tariff that applies to your customers for sending instant messages (e.g. On-net messages). 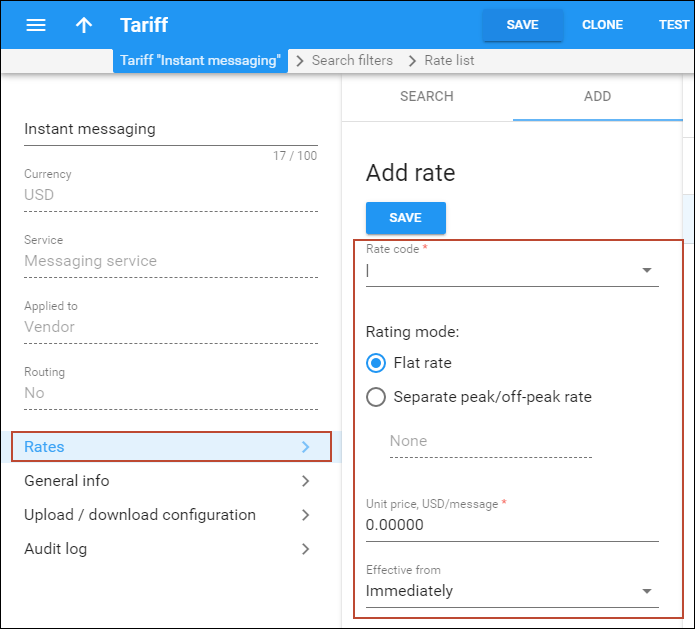 NOTE: There is currently no need to create a special tariff and rating entry for incoming messages as they are considered free by default. 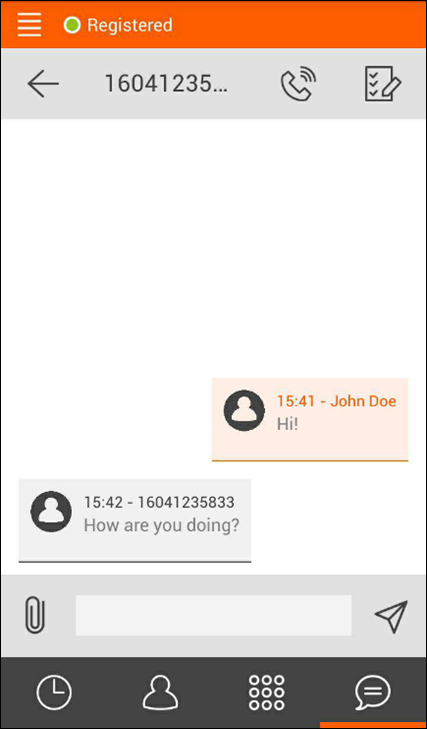 Now your SIP subscribers who have this product can use instant messaging service in addition to VoIP services. Note that if you have more than one virtual environment where you will provide instant messaging service, you will need to perform the above steps for each virtual environment. Configure the messenger client. As an example, we use Linphone (http://www.linphone.org/releases/windows/Linphone-3.9.1-win32.exe). 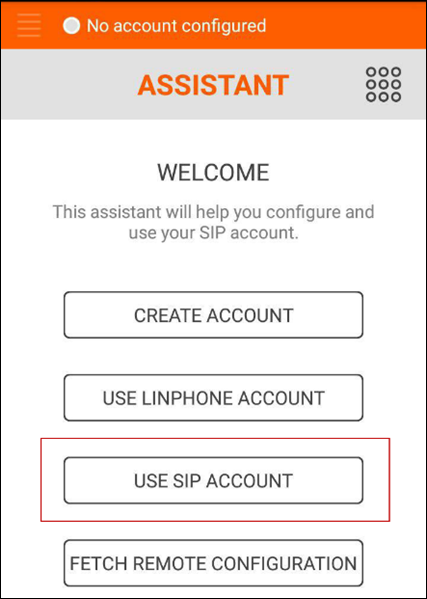 Download Linphone and perform its configuration. 2. Fill in the Assistant form. · Username – Specify your account ID here. 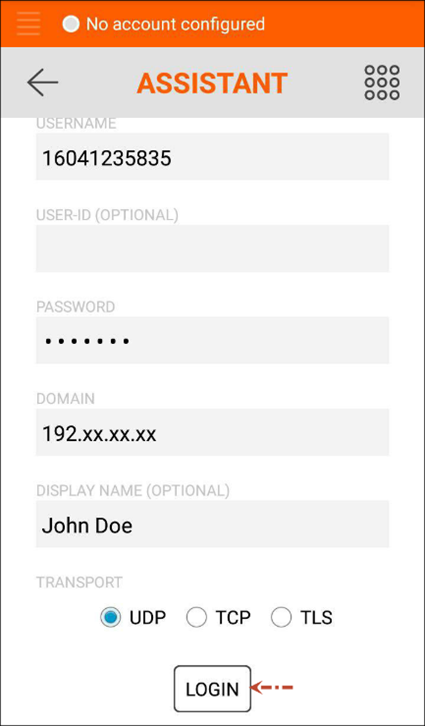 · Password – Specify the service password in this field. · Domain – Specify the VIP of your PortaSIP® cluster. · Display name – Specify your name. This is a display name that will be shown to the party you call or send messages to. · Transport – Select UDP. 5. Select Chat and Add Conversation. 6. Enter the number and send a message.